A User Interface library and plugin for creating GUIs in Minecraft’s chat box. To enhance player user experience on multiplayer by utilizing the chat box. In addition, this plugin provides a graphical approach to tasks commonly performed with commands. 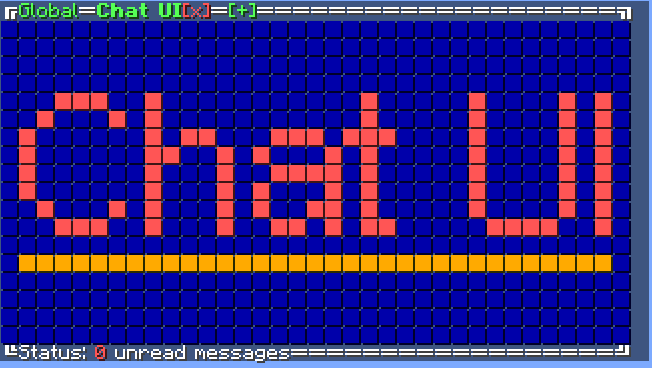 For a full description and demonstration of Chat UI’s features, please check out the wiki. Since version 2.0.0 Chat UI has split into two components. It now requires Chat UI Library in order to function. The library provides the infrastructure for building interfaces in chat, and Chat UI provides an end-user experience with its tabbed interface. For UI configuration (width/height/etc) refer to Chat UI Library’s configuration. The features section defines configuration for features registered to Chat UI. This includes any other plugins that add features to Chat UI. Each feature has it’s own subsection with the key being the plugin ID and feature ID. Features can be enabled or disabled with the enabled key. player-settings store the Chat UI specific player settings, indexed by the player’s UUID. Not to be confused with the player-settings option from Chat UI Library. The only setting at the moment is enabled. If set to true then the interface is enabled for that user, otherwise if false it is no shown. Settings in this config section are typically controlled by the player’s interaction with Chat UI, the server admin need not configure manually. Chat UI Library has several commands for configuring the UI. When the interface is enabled, /chatui disable will disable it. When disabled, /chatui enable will enable it again.